Importance. - Strumella canker is less common in the southern Appalachians than in the Northeast. Its most common hosts are members of the white oak group; however, beech, basswood, blackgum, and shagbark hickory are occasionally affected. Identifying the Fungus. - The fungus produces dark brown, cushion-like structures,about 1/20 to 1/10 inches (1to3mm) in diameter, on dead bark and surrounding tissue. Urnula craterium has been described as the perfect or sexual stage of the fungus causing strumella canker. The urnula fruiting body is cup-shaped and grows on infected branches and stems that have fallen to the ground. Identifying the Injury. 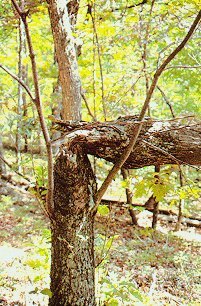 - Strumella cankers are of two types; diffuse and the more common target shape. Diffuse cankers develop on smooth-barked saplings and rapidly girdle and kill the trees. Targetshaped cankers are more common and are formed by the alternation of cambium killed by the fungus around the canker perimeter and then the formation of a callus ridge by the host. Cankers can reach several feet in length. Oak killed by strumella canker. (Click for detail. JPG 38K). Biology. - As with many canker diseases, the fungus usually enters the tree through a branch stub. The remnants of this stub can be seen at the canker center. Frequently, diseased trees bear multiple cankers. Control. - There is no control for this disease under forest conditions. However, cankered trees should be removed during sanitation or commercial thinning operations. Severely diseased trees in recreation areas should be removed for safety.